By God’s grace, I did it. 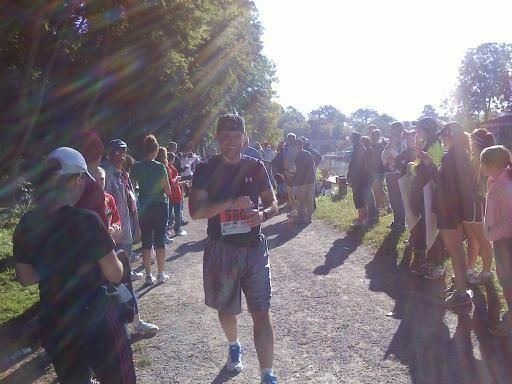 Last weekend, I ran in my first marathon! 26.2 miles. My time was 4:31:22. Yes, that means I ran for over four-and-a-half hours! Pretty insane, huh? My wife and I have been running seriously for about 3-4 years, and about three months ago, I decided to begin training for the Rochester MVP Marathon. I saw my brother Ben run the same marathon a few years ago, and it was a very inspiring thing to watch. 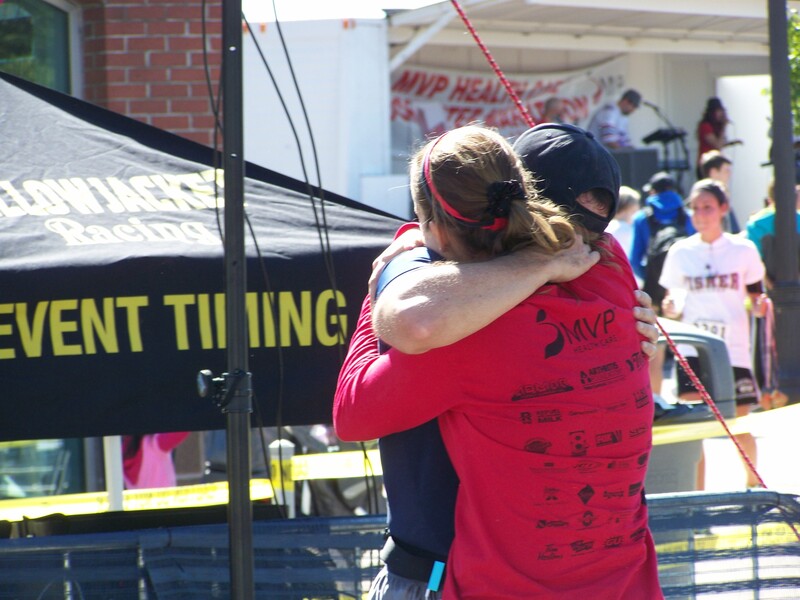 But, watching him train and run the race, I also knew how hard it was. Quite honestly, there were times during my training when I wasn’t sure I could do it, but after some encouragement from friends who’d already run marathons, some adjustments to my training strategy, and good ol’ perseverance, I did it. The whole experience was very moving, inspiring, and spiritual. I’d have to say that it was one of the most incredible experiences in my life (top 10 at least). And anyone who knows me knows that I’ve been a lot of places (over 17 nations) and done a lot of things! The weather was perfect. My first 20 miles were filled with worship and thankfulness while listening to music on my Ipod, and then I “hit the wall” at mile 21. That means my body started to give out. My right inner quad started to spasm, I had throbbing pain in my left knee, and I had to adjust my pace and gait. The next four miles were simply endurance while in pain. 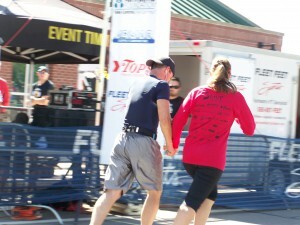 The final mile was fervent prayer for strength, as my body didn’t seem to have anything left. Yet I sensed the nearness of the Lord in a very profound way. The finish line was awesome, as crowds of people cheer anyone and everyone to the finish who dared run that race, and among them was my wife and children. 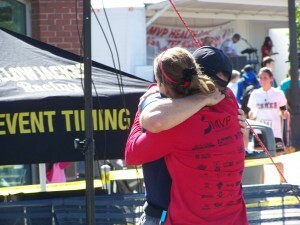 Such emotion overwhelmed me that when I crossed the finish line, I broke down and wept on my wife. 1. Training makes the run possible and enjoyable. I caught myself smiling often during the first 20 miles. I was amazed at how well I was running, how beautiful the day was, and that I was actually going to be able to do this. What made it possible? The fact that I had trained so hard for three months previous to the race! Likewise, the Bible says, “Train yourself in godliness. Exercise for the body is not useless, but godliness is useful in every respect, possessing, as it does, the promise of Life now and of the Life which is soon coming” (1 Timothy 4:8). God has a race for all of us to run, and as we study the gospel, learn to know God, say no to sin, and develop godly relationships, we prepare ourselves for the race. 2. Encouragement makes a huge difference. On my long training runs, I’d often find myself on a lonely road, having to dig deep in the midst of boredom to finish the run. During the race, however, with thousands of people lining the streets, and surrounded by hundreds of other runners, encouragement was abundant. It made such a difference to have constant encouragement every step of the way. On my final mile, as I was praying out loud to the Lord for strength, a woman passed me and said, “You can do all things through Christ who strengthens you!” Wow. That was timely. I was so thankful for that. Likewise, on the journey of faith, those who “endure to the end” are the encouraged ones, not the discouraged ones. An encouraged Christian is a fruitful Christian. Let’s make it our aim to encourage one another in God’s grace. 3. Building in walk breaks gave me strength to run the whole race. Early on in my training, my long runs were excruciating because I tried to run without stopping. But as I further educated myself, I learned that taking walk breaks during marathons is actually a helpful strategy. I actually read that, “The walk breaks early in the race are the most important ones, because if you’re already tired, it’s too late.” I applied this idea to my race strategy, and it had radical results. The most amazing thought was, while at mile 25, I realized that I had the strength I needed to finish because I took a walk break at mile 5. I’ve seen a lot of “on fire” Christians come and go, but the life that God rewards is the one to whom he can say, “Well done, good and faithful servant.” I’ve experienced spiritual burnout. I’ve been that guy that doesn’t feel anything anymore, and has run out of spiritual energy. But I’ve learned to rest in Christ. The Book of Hebrews indicates that he is our “Sabbath Rest” (Hebrews 4). The idea here is that, like in the creation account where God worked six days and rested on the seventh, so man “worked” for six days through the Law of the Old Testament, but in the New Testament—in Christ—we rest from our labors. To rest in Christ is to realize that it’s His strength, not mine. To rest in Christ means that I don’t have to change the whole world, I just have to do His will. To rest in Christ means that I’ll accomplish more in six days trusting Him than seven days striving. You can’t try to beat anyone else in a marathon. You’ve got to run your own race. It would be foolish to try to run someone else’s pace, when I’d trained at my own. Likewise, the Bible says, “Therefore, since we are surrounded by such a great cloud of witnesses, let us throw off everything that hinders and the sin that so easily entangles, and let us run with perseverance the race marked out for us” (Hebrews 12:1). Notice there’s a race marked out for us. We must run our own race, understanding that God sovereignly designed each of us the way we are for His own glory and specific purpose. 5. God’s presence is with His people. 6. My wife is an amazing woman. I already knew my wife Heidi Jo was amazing, mind you, but even I was shocked at how brightly her light was shining during my race. 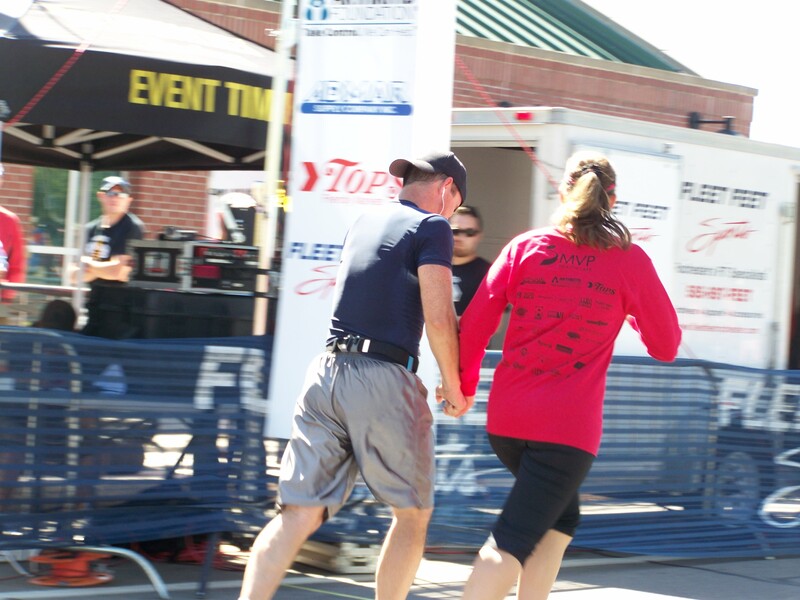 She ran on a quarter marathon team, and we got to start the race together, but once she finished her leg, she spent the rest of her time driving to the other exchange points, just to catch a glimpse of me and encourage me along the way. I could spot her from a mile away, it seemed, as she would raise her arms in the air, leaping with excitement at the sight of me, her smile cutting through the crowds into my heart. 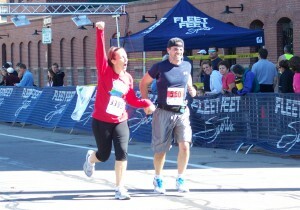 At the finish, she leapt over the fence, and ran by my side, cheering my every step. Perhaps more than anyone, she was the Christ-figure in my race. Is that how you view him? I think often we see a different face, though not his true face at all. Sometime we see an angry scowl, or disapproving glare, arms folded, or finger wagging toward us. That’s not what I see. I see a Savior much like my wife, cheering for us, smiling, running along side, encouraging, raising his arms in victory at every milestone. Isn’t that our great High Priest? I’m already planning to run the Rochester marathon again next year. Looks like my brother Ben is going to join me. May you find grace to run your race as well. Hope this blog encouraged you. Your analogy was so good! Thanks for the tears! Thanks for showing us a picture of running the race! So great Derek! So many analogies with running a marathon for sure! I used to think I didn’t have much of a testimony…but, now when I give my testimony one of the most defiing moments of my spririual walk is training for and running my marathon. It was, like you said, one of the best experiences of my life. So spirtiual…in my training, the Lord showed me how much he truly loved me, which I had questioned up to that point in my life!! It is so inspiring to see someone do something that is so physically challenging, and yet they do it anyway! Great work! 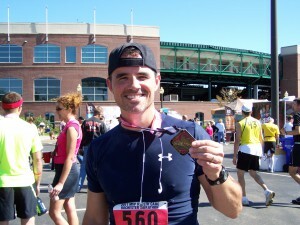 And, I secretly want to run the marathon next year too…we will see how my body responds to some training first though!! Now, if we can only get Mark on board! PS. I teared up when I read the part about Heidi! You two are such a great example! Thanks, Katie! That’d be awesome if you ran next year. My brother Ben did in fact commit to doing it with me. Mark? We’ll see…maybe the half?? Derek, my first marathon was NYC. I often share that I had to finish because that’s where I was going to find my ride back home. Keeping that thought in mind kept me pressing on. When I finished I broke down and cried. There was never another experience that compared to that first marathon. Happy running…..great time to be alone with Him. I knew you were a serious runner. Didn’t know that story, though. Such an inspiring experience. Thanks for the comment! Well done, Derek! Charles is planning to run the Istanbul marathon and I’ve sent him the link to this! Wow…now THAT would be fun! Hope he does well!! Such an encouragement. Thank you for posting and expounding, Derek. 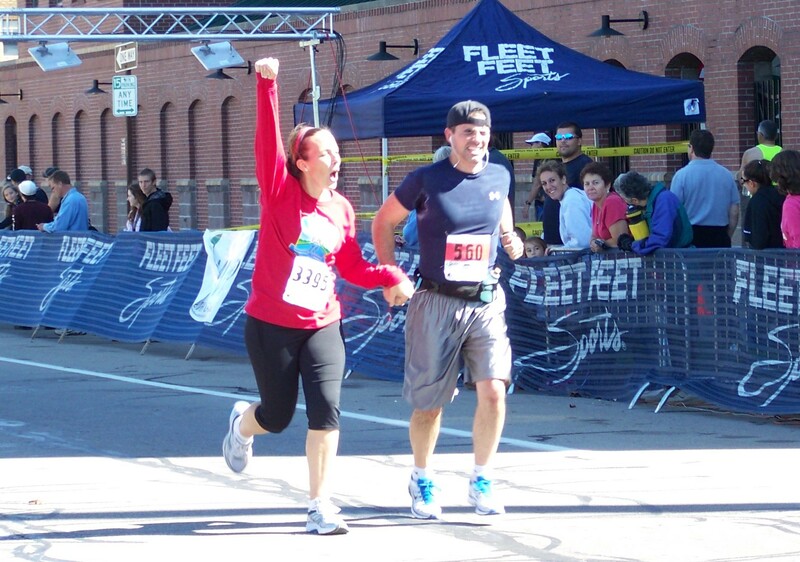 My wife and I are about to run our first half-marathon on Oct. 1. I’m hoping to leapfrog to a marathon a couple months afterward. I had already planned to sit us down to watch Chariots of Fire this weekend to prep us; now you’ve sealed the deal. Congratulations on your awesome accomplishment. My coworker’s goal is a marathon in every state. Further up and further in! Thanks for this. Rick and i have our own marathon of sorts that we’re running at the moment and it is wearisome… but we are almost there, or so we think. I esp like what you said about running YOUR rac.e the race God gives us. so important to remember. i think my fave is about you and heidi and then about how you said Isn’t that our High Priest? this is real good stuff, derek. thanks so much. and congratulations!!! so awesome! Thanks, Angela. Much grace to you on your journey. Oh I ache for Christ. It’s always great to hear from you whether it’s your music, your messages or your blogs. Congratulations to both you and your wife. God is good!